1. Usage: It is suitable for BOPP, PET, CPP, PVC and combined film and paper with the same nature. 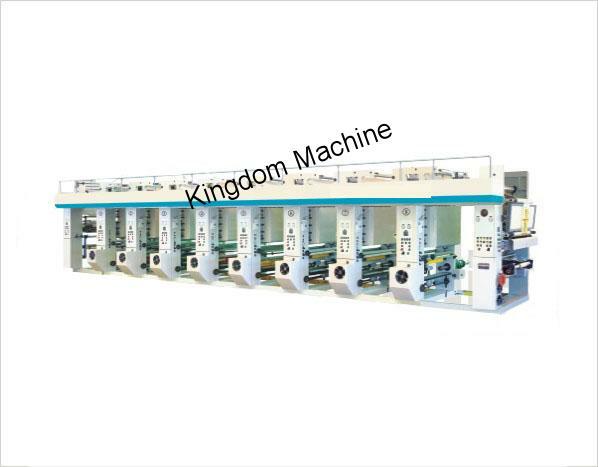 Its printing speed is 100-120m/min. 2. Main transmission device: The main transmission device adopts vector inverter of Shenzhen Huichuan to control the vector electric machine, transfer each group of running blocks. Performance: Save electricity. 3. Block installing Device without Axis: The installation of blocks adopts air cylinder to pull the core of axis to install the blocks. The horizontal adjustment adopts the movement of screw. Performance: Reduce time to replace the blocks, assure the boards to be concentric, improve the quality of product. 4. Structure of ink scraper: The ink scrapers can be adjusted up and down as well as its positions. The pressure of scraper adopts single air pressure style. The horizontal movement adopts both the rotation of the electric machine and movement of cam. Performance: Lengthen the service of the blocks. 5. Impression Lift Structure: The impression adopts dual air cylinder to impress through lifting to position the slipper which is a protector for the air leakage of the cylinder and also a protector for falling of the cylinder when the machine stops working. Performance: Assure the average of pressure and chromatic aberration. 6. Chromatic Mechanical Handles: They adopt computer to control, synchronic electric machine to transfer the ball thread bar to adjust the chromatography through reducing the speed to register control automatic. Performance: Rotate wish lubrication and high precision in chromatography. 7. Material-Collecting and Feeding Device: The material collecting and feeding stand adopts dual scaffold. It can replace coils and collect materials automatically. The extension and traction of material collecting and feeding adopt inverter vector to control the line speed. Performance: Accelerate the stabilization of chromatography, position the block in horizontal direction, save materials, ink, impress and energy for large quantities of producing, and while the speed of material collecting is 120m/min, the most waste of material collecting is about 10 meters, it can save about 40 meters comparing with Three Electric Machines, it can save about 20% ink, impress and energy resources, and lower the cost of the product largely. 8. Dry and Device: The oven adopts centrifugal blower to blow and make suction, the electric tubes are installed averagely in each group of ovens at their blowing mouth to heat. The temperature is controlled by intelligent temperature control instrument. The head of roller adopts the way of water cooling to assure that keeping the temperature of the films in a low degree, Performance: Electric saving.